Maintaining a business facility used to be hard work. With the introduction of equipment such as floor scrubbers and sweepers, however, cleaning large facilities has switched from backbreaking labor to a more laidback process. Some business owners, however, still go for the less costly, traditional mop and bucket system instead of the more expensive and advanced industrial sweepers and scrubbers. The first option, though, can be quite inconvenient as hand sweeping and mopping still leave behind dust, dirt, and grime. Add that to the burden of manually cleaning a huge commercial space. In this case, a wiser option could be the use of industrial sweepers and scrubbers. While brooms and mops can definitely clean, they are often not as effective as their mechanical counterparts in removing dust, debris, and tough grime. In fact, did you know that sweepers and scrubbers can reduce your cleaning time to half? A riding floor scrubber, for example, can wash and scrub large floor spaces in just one go. Even better, these industrial sweepers and scrubbers have large cleaning heads that are capable of cleaning a large area in a single pass. 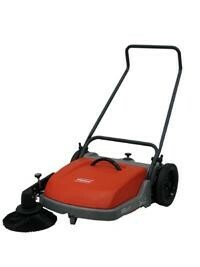 Thus, increasing its efficiency by up to 100% when compared to manual cleaning. In addition to cleaning efficiency, manpower efficiency is also significantly increased because less effort is needed to be able to operate these industrial cleaning tools. Piloting a riding floor scrubber, for instance, requires you to simply sit on the machine and drive it around the facility. Investing in industrial equipment, though, could save you both the time and money as you can reuse them for years to come. You’ll only need to train your cleaning crew to do the job properly. After all, cleaning large facilities, whether it be a factory, school, or hospital, can be a time-consuming task. In fact, this is why some companies even hire cleaning services just to finish the task in a timely manner. While these services may seem less costly than investing in machines, you will often save money in the long run. Even if they require bigger capital outlays, industrial sweepers and scrubbers will prove worth the investment. Not only are they durable but they also clean quickly and efficiently thereby saving time, effort, and money. To ensure that your equipment will last, purchase them from a reputable supplier.